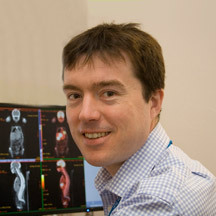 Dr Stewart Redman trained in Radiology in Southampton and took a leading role as Chair of the Junior Radiology Forum at The Royal college of Radiologists. He was appointed a Consultant in Bath in 2007. He is a Clinical Lead in Nuclear Medicine and he has set up several new services including 3D bone scans, 3D V/Q (lung) scans and DAT (dementia/parkinsons) scans. His radiological interests include Head and Neck and Gastrointestinal Radiology. He is a keen medical educator having obtained his Post Graduate Certificate of Medical Education in 2007. He teaches medical students, radiology registrars and more recently is leading training of the Accident and Emergency staff in CT.
Lead Trainer of the Accident and Emergency staff in CT. Consultant Radiologist at the Royal United Hospital, Bath.